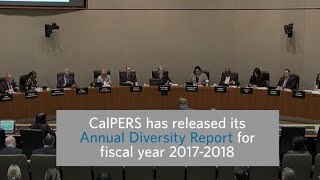 CalPERS is committed to a work environment that promotes and supports diversity and inclusion. The Investment Manager Engagement Programs (formerly Targeted Investment Programs) team works with the CalPERS Diversity Outreach Program to engage and promote a diverse workforce and extend that philosophy to our stakeholders. We also host the Diversity Forum, which explores the representation of women and minorities in business. Marketplace - We serve our members with sensitivity to their diverse perspectives. Our business partners include certified Small Business and Disabled Veteran Business Enterprises. Workforce - We recruit and retain a high-performance team inclusive of our state's rich diversity. Workplace - We actively educate our leadership and staff to increase diversity and inclusion awareness, understanding, and skills that lead to greater quality, respect, and accountability. The Diversity Forum assembles an outstanding lineup of CalPERS Board Members and senior staff, institutional investors, business and academic leaders, and consultants from around the country to discuss diversity and inclusion in the business world. Visit Diversity Forum to learn more about the event, and review information and resources from past Diversity Forums.